The Cliff™ range of handles are intended for use on wood, MDF, chipboard or metal enclosures. Manufactured from a range of materials, including ABS, GRP and PP, our handles are designed to enhance the appearance and functionality of any equipment to which they are fitted. All models are suitable for the most demanding applications. Some parts can be custom branded. CH-1 for use on cabinets up to 19 mm thick or metal enclosures. For wood, use screw number 6 and for metal use 4 mm diameter bolts or pop rivets. The support flange behind the front upper face should ideally make contact with the top face of the cutout so that all the weight is not on the fixing screw. The standard colour is black, (PP). CL1910 CH-1 pocket handle. Weight 9.8 Kg. per 250. 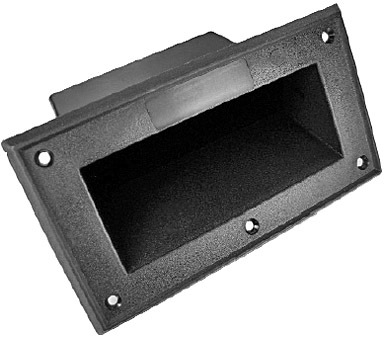 CH-1A for use on cabinets up to 19 mm thick or metal enclosures. For wood, use screw number 6 and for metal use 4 mm diameter bolts or pop rivets. 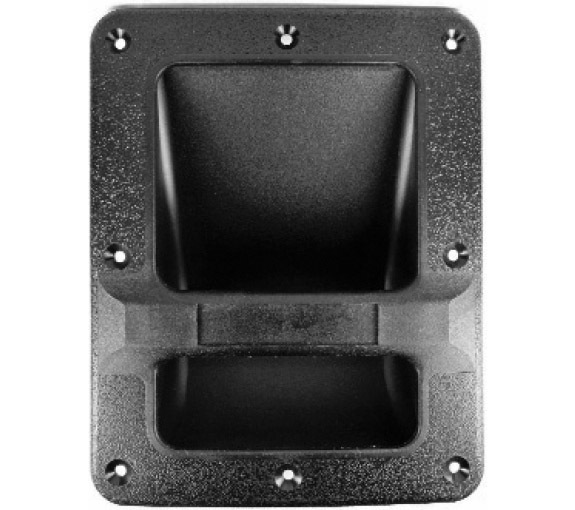 The support flange behind the front upper face should ideally make contact with the top face of the cutout so that all the weight is not on the fixing screw. The standard colour is black, (PP). CH-1A is much larger than CH-1. FCR6878 CH-1A pocket handle. Weight 8 Kg. per 100. CH-2 CH-2 is a heavy duty bar handle designed for use on larger, heavier wood or metal cabinets. It comprises a front and a back plate which snap together. This two part assembly gives a reduction in storage space compared to one-part handles. The mounting flange is provided with a moulded molded sealing rib which gives an airtight seal on cloth or plastic covered cabinets. For a watertight seal, use a sealing compound under the flange. 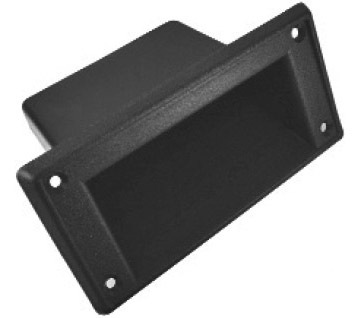 A moulded molded recess in the bar can accommodate a name plate or logo. Vertical / horizontal pull strength, (on a 19 mm. chipboard cabinet): > 300 Kg. Fixing screws: select a suitable length for the cabinet with a 90 degree head taper. 8 screws required. Maximum front protrusion: 8 mm. CL19122 CH-2 bar handle front. Weight 17 Kg. per 100. CL19123 CH-2 bar handle back.